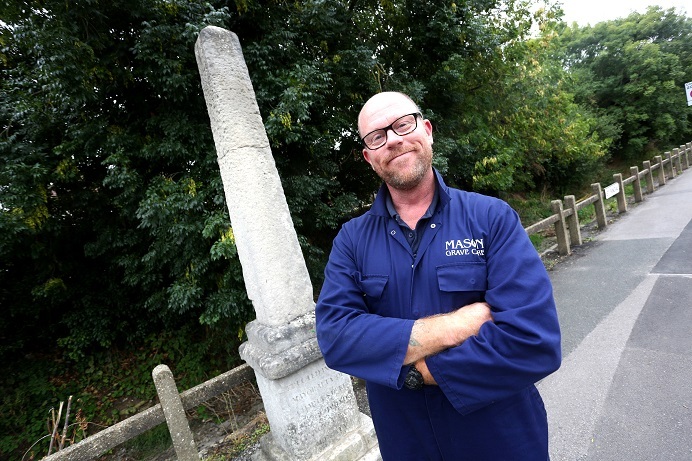 A STONE mason has been given permission by Chichester City Council to clean a historic landmark in the city. St James’ Obelisk, situated on the junction of the Westhampnett Road and St Pancras roundabout was erected in 1745 and nobody is entirely sure when it was last cleaned. Glen Mepham started out as a trainee bricklayer before being offered an apprenticeship with Cathedral Works Organisation. He said: “I have worked on the Cross, Pallant House, Chichester Assembly Rooms, Southsea Castle, and the Guildhall in Priory Park for Cathedral Works before joining their ‘small works’ department where I developed a passion for cleaning gravestones. “I set up Mason Grave Care two years ago as a part time business covering West Sussex, Hampshire and parts of Surrey. I’ve had the pleasure of cleaning the memorial stone in Tangmere commemorating Tangmere Airfield’s role in both world wars. “We mainly clean and restore headstones/graves but also anything that is made of stone or brickwork using a biological solution, and lots of scrubbing, that is eco friendly and safe to use around plants, etc. “All techniques that we use are sympathetic to the material that we are cleaning or restoring and no abrasives or wire brushes or bleach are ever used. The Obelisk was erected in the mayoralty of Charles Duke of Richmond Lennox Aubigny and was used to mark the boundary of the city on the east side. Glen will start cleaning the landmark on October, 15.